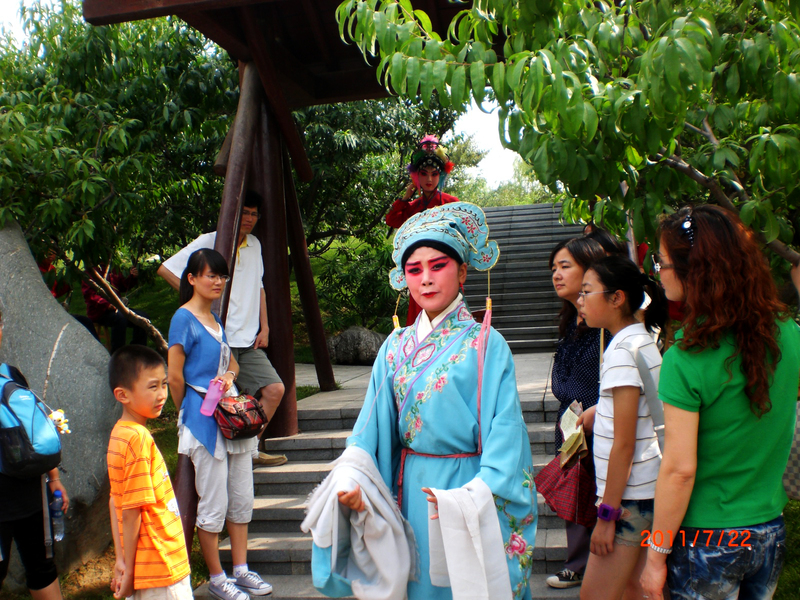 During our first visit to China we went together with MIL and my parents to the Tang Paradies in Xi’an. The Tang Paradies is a huge cultural theme park all about the Tang Dynasty located in the Qujiang Resort in Xi’an with the Big Wild Goose Pagoda very nearby. Mother-in-law invited us for a full day program in this cultural theme park so we left in early morning to avoid too long queues at the ticket stands. However the entrance area was already filled with people and while MIL tried to get us into a group for the group ticket discount my parents and I became famous with a deaf school children group. Thanks to them the time flew by pretty quickly taking all kind of group pictures and writing down our names and where we are from. First things first. If you plan to visit this park really make sure to have the whole day time as just walking the main path around will take already several hours. I would even go as far as saying you won’t even manage to visit each little interesting corner of the park in one day! After going through the entrance gate it really felt like entering another place entirely as the city and the noise vanished and the Tang Paradies was all around us. You might imagine it is boring to walk around a park which is about such a topic but really it was really nice to go around and see the different sections of the park. The only thing which was bothering us was the heat but there is nothing else to expect when traveling in China during July! 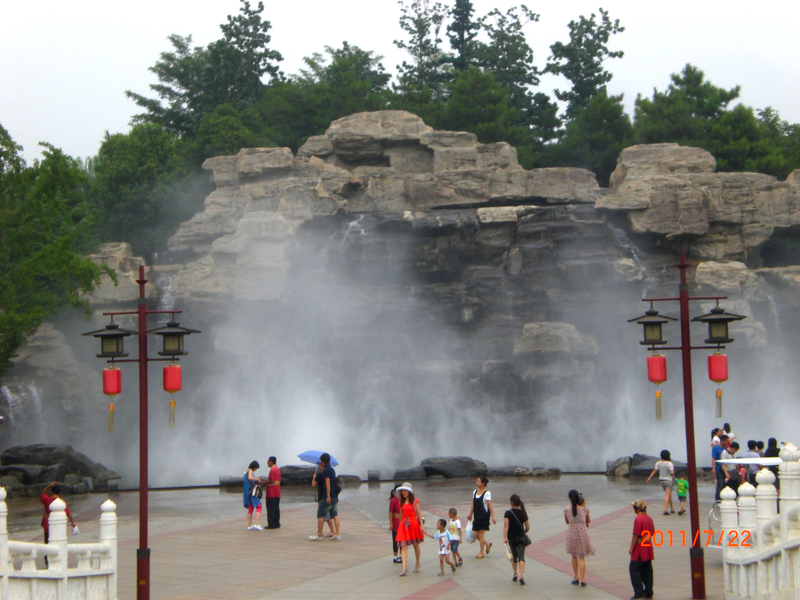 The Park has many scenic areas with different cultural themes. What made it very enjoyable at least for me was the smell! No bad city smell around as the path has every few meters incense burners to fill the air with a nice fragrance. All around the park you can encounter interesting things such as poetry, song and dance or also the most important thing: Food! Why am I emphasizing this? Well, as mentioned before on that day it was incredibly hot and during midday MIL and my wife got hungry so they got themselves some hot and oily noodle soup. Meanwhile my parents and I were just suffocating by the heat and could only eat some ice cream. Even looking at my wife and MIL eating this warm dish made us sweat even more. All around the park are places with water. In the middle is a lake in which the main Palace is reflecting like a mirror. There are little rivers near the paths which help to survive the heat at least a bit. You like to see some little fishes? There is a section of the main lake filled with hundreds if not thousands of coloured carp fishes. You can also buy some fish food and feed those greedy monsters which will result that the water appears to be boiling by all the movement the fishes are making. I can’t say what was more amusing for me, those monsters fishes or MIL trying to tease them by throwing very little food at a time into the water and laughing at the same time nearly hysterically. In the evening there is another very interesting thing, a water movie. It is a movie screened on the water spray created by several fountains. In the end of the movie when people start to leave the park there is still a nice firework display. I am no expert when it comes to fireworks but I think it is a pretty decent one and also worth filming. I got the idea to write this post because I found my old camera again with all kind of nice pictures of our first trip to China. So prepare yourself for some more articles about my first trip to China! 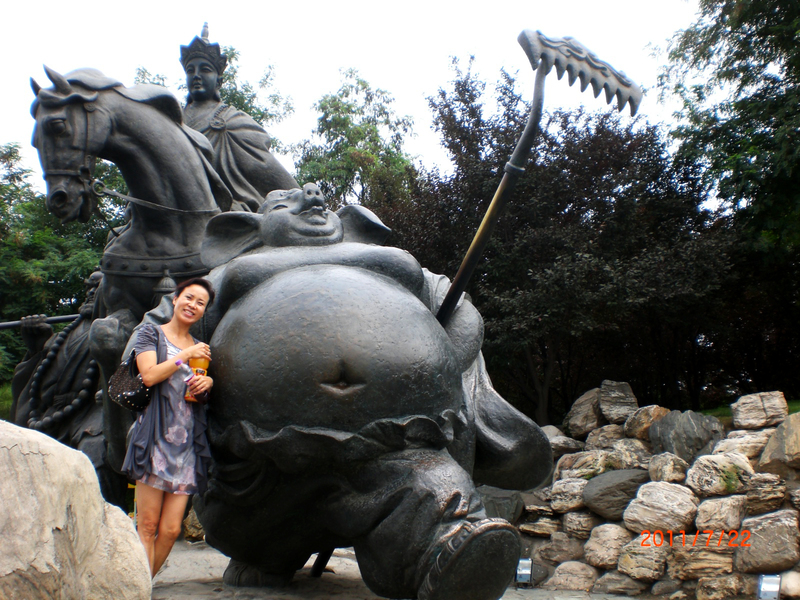 Have you ever visited the Tang Paradise before or are you planning to travel to Xi’an someday? I love theme parks! This looks like a gorgeous one. I also still have so many photos from Japan and the States that I haven’t even organized, let alone blogged. You’ve inspired me to start doing some flashback posts :). ‘MIL and her best new friend’ picture made me nearly spray my computer with morning coffee. LOL They have koi fish at several temples here in Taiwan and all you can see is wide open mouths trying to catch the food that is thrown in. And of course, there is a lot of teasing by the feeders as well. Yeah, MIL was posting with each character from the story but she appeared the happiest with the pig ! If I have the time, I’d like to check it out. It looks interesting. I suppose you are well-travelled through China, eh? However xi’an has a lo to offer so we always had some place to visit every few days during my trips to China. I have been to Xi’an but not to this place! Maybe it wasn’t even opened when I went? (early 2008). In fact, eating hot and spicy things is a good remedy against the heat 😀 You will feel so hot while eating that when you finish you will think it is actually not that hot anymore… hahaha. I think that place opened in 2005 but not too sure now. I’ve never been to a theme park like this. It looks like a lot of fun! I like the historical aspect. I remember the summer heat in China. It can get so hot and humid that it’s crazy. I would so eat ice cream to. The hot noodles would make me want to pass out. The picture of you MIL with her new best friend made me laugh so hard. She sounds like quite the character teasing those poor fish with very little food! It looks like a beautiful theme park, and not too crowded. The first picture looks like it was inspired by the Summer Palace. Man – we feel totally ripped off that we never got to get here. Sounds like a novel thing to do – wish we had read about it before we went to Xi’an. Guess we will just have to go back one day.